If you ever find yourself in a boxing match with a kangaroo, watch out for its left hook. A Russian biologist named Yegor Malashichev says that the marsupials tend to be left-handed—or rather, left-pawed. Figuring out how some species of kangaroo and wallaby evolved to be southpaws could help scientists understand how humans evolved handedness. Like us, these creatures from Down Under are bipedal: they stand on two legs, and the link between walking styles and hand preference may be more than a coincidence. The origins of handedness are much debated, but one leading theory suggests that upright posture is the key to developing a favorite side. Human beings were once thought to be the only species with a consistent bias toward one hand. Estimates suggest that as many as nine out of every ten people are right-handed, and some studies say that this proportion hasn’t changed much since at least the time of the Neanderthals. Other biologists have tried to connect which hand we favor to asymmetries in the human brain. For instance, previous work posited that the evolution of handedness is linked to the development of language in the brain. That fits with observations showing that in 90 percent of righties, the left half of the brain—which controls their dominant hand—also houses regions specialized for speech. But then again, 70 percent of lefties are left-brained for language as well. While it’s long been known that individual animals other than humans can favor one limb over another, scientists originally expected a 50:50 split in preference across entire species. But like so many other characteristics thought to make our species special—such as the ability to recognize oneself in the mirror—the notion of handedness as a unique human quality has been coming under fire. “These results, in addition to research conducted with other mammal species, truly do challenge the traditional belief that handedness is a uniquely human trait,” says Stephanie Braccini, curator of mammals at Zoo Atlanta. Braccini joined a cadre of researchers that, in the late 1980s, began to systematically and controversially argue for handedness in other primates. She showed that chimpanzees are more likely to favor one hand when standing than when sitting, scoring another point for the postural theory. And in the largest study of captive chimps, which included hundreds of animals across three facilities, Bill Hopkins at Georgia State University found about twice as many righties as lefties. He tested the chimps by having them dig peanut butter out of plastic tube. Images of the primates’ brains revealed compelling asymmetries. Critics have countered that the primates could have picked up this behavior from their human keepers. Follow-up work in the wild has complicated the picture, suggesting that populations of chimps isolated from contract with people do tend to use their right hands for certain jobs, such as sponging up water with leaves, but favor their left for others, such as digging up termites with sticks. “They show a population-level bias that is different for different kinds of tasks,” says Hopkins, a cognitive neuroscientist. Kangaroos seem to be more consistent. With support from the National Geographic Society Committee for Research and Exploration, Malashichev and two of his graduate students from Saint Petersburg State University spent 18 weeks tramping around Australia with cameras. Living in bungalows in the bush and tents in Tasmania, they painstakingly photographed dozens of wild kangaroos and wallabies going about their daily lives. Whether tearing up grass to eat or scratching their noses, most of the animals tended to favor their left arms. Two species studied by the team, the eastern grey kangaroo and the red kangaroo, led from the left both for gathering food and grooming themselves. So did red-necked wallabies—with one exception. While down on all fours, the wallabies did not play favorites between their paws when feeding. For the researchers, that exception further strengthened the link between upright posture and handedness. So did the behaviors of a third kangaroo species they observed at a zoo in Sydney: Goodfellow’s tree kangaroo. As its name suggests, this animal inhabits trees, living a more quadrupedal lifestyle that involves less walking around upright. It employed both paws equally for its day-to-day activities. 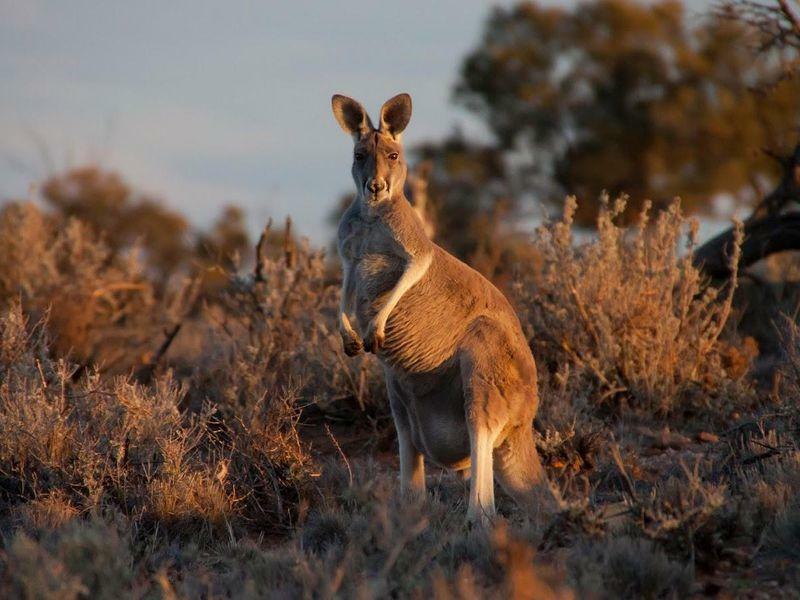 Why kangaroos favor their left paw instead of their right is a mystery. Malashichev suspects the bias may have arisen somewhat randomly during the course of evolution; elements in the brain that could have developed either way happened to take a left turn. Marsupial brains are known to be quite different from ours—for one, they lack a corpus collusum, the thick tract of fibers that connects the left hemisphere to the right in the human brain. But further work would be needed to connect specific elements of brain anatomy to handedness. Other animals have equally mysterious asymmetries. Baby chickens tend to use their right eye to spot food, and baby whales prefer to follow their mothers on the right. Wrap a balloon around a cane toad’s head, and the hapless amphibian will usually try to swipe it away with its right foot. Watch an Australian parrot carefully, and you’ll notice that it grasps for food with its left claw more often than not.